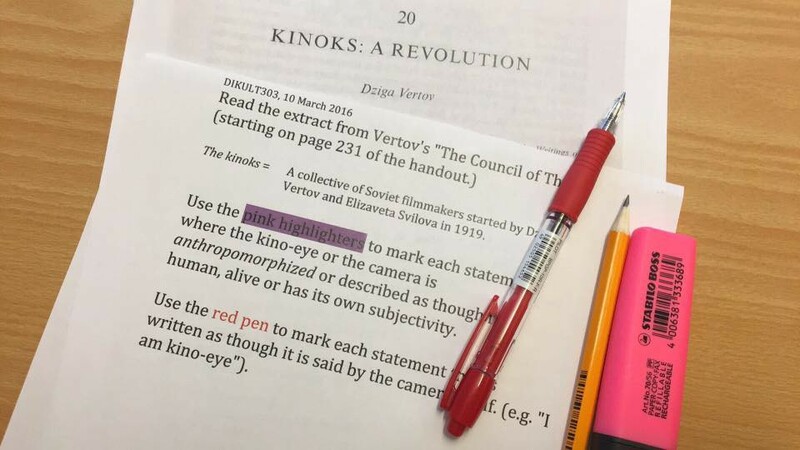 This semester I’m teaching a graduate seminar in digital media aesthetics on machine vision, and in today’s class we discussed drone art, using Dziga Vertov’s manifesto from 1923 (“I am kino-eye, I am a mechanical eye. 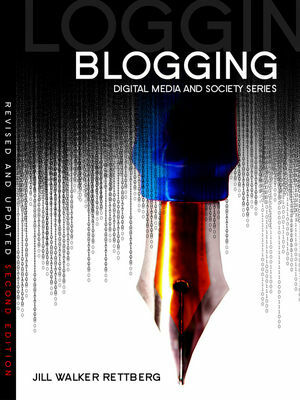 I, a machine, show you the world as only I can see it.”) and Daniel Greene’s article “Drone Vision”, which was published in Surveillance & Society last year. The art works we discussed were James Bridle’s Dronestagram, the anonymous Texts from Drone, and Muse’s VR music video “Revolt”. I thought the class went really well, so I wanted to describe what we did. A major point in Greene’s article is that Texts from Drone anthropomorphizes drones, whereas Bridle’s piece does not. Vertov certainly anthropomorphizes the camera in his manifesto, and I find this anthropomorphication very interesting, especially in terms of posthumanism and shared cognition between humans and machines. I wanted the students to mark passages where the movie camera was anthropomorphized or where it was the speaker in the sentence. Doing this in detail led to really interesting discussions. We talked about passages where it was not clear who the “I” who was speaking was. In one paragraph it’s the human authors of the text (“We affirm the kino-eye”) and in the next it seems human at first (“I make the viewer see…”) but then it’s definitely the camera speaking (“I am kino-eye. I am a builder.”) Then we leave the first person perspective for a while before sliding back into the human subject position: “I promise to drum up a parade of kinoks on Red Square.” And the conclusion positions the camera as secondary to the human: the kino-eye challenges the human eye, and the kinok-editor organises the images produced. The students noticed that the first stage of anthropomorphising the camera was to refer to it as though it was a slave in need of liberation. Objects do not need to be emancipated. The grammar of sentences is used too, allowing the camera to be the subject of the sentence in the middle portion of the manifesto, but only to be the object in other sections (“The camera ‘carries’ the film viewer…”, “I have placed you…”). I will definitely plan this kind of directed reading in future classes?—?it was very productive. Next we looked at a few minutes of Vertov’s Man With a Movie Camera, and then moved on to Greene’s article about drone vision. The students had already written their discussion forum posts about the different art works, so they talked about each of them, but paying more attention to the question of anthropomorphisation of the drones, using the Vertov we had just read. 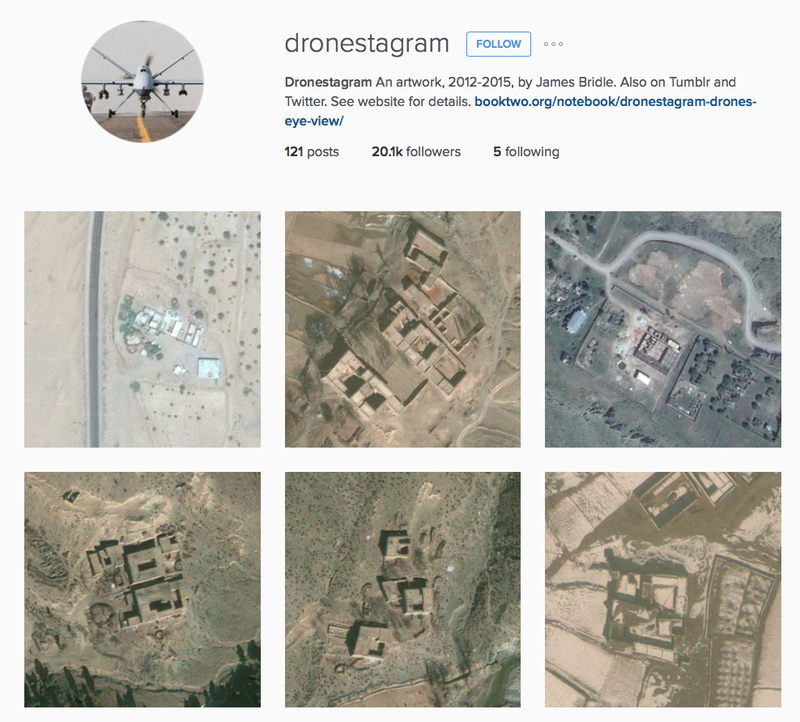 An important point in Greene’s argument is that Bridle’s Dronestagram in some ways buys into the military-industrial complex’s portrayal of drones as objective and precise, making war “smart”. The bloodless images are bland enough to be displayed on a coffee shop wall. 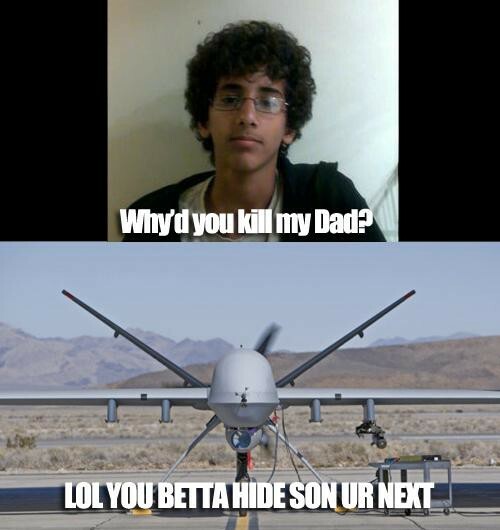 The piece aims to subvert our understanding of drone warfare, but instead makes us empathise with the drone itself, or the drone pilot, not with the victims. “Bridle mistakes the discourse of drone vision, the story of seamless, imperial visual supremacy, for its operation,” Greene writes (page 241). 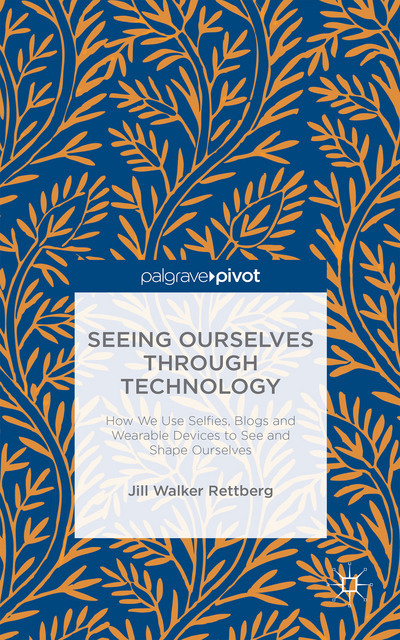 In fact, though, Greene argues, by trying to let the viewer occupy the drone’s eye view, we “embrace the discourse of drone vision, rather than the work of it” (page 242). 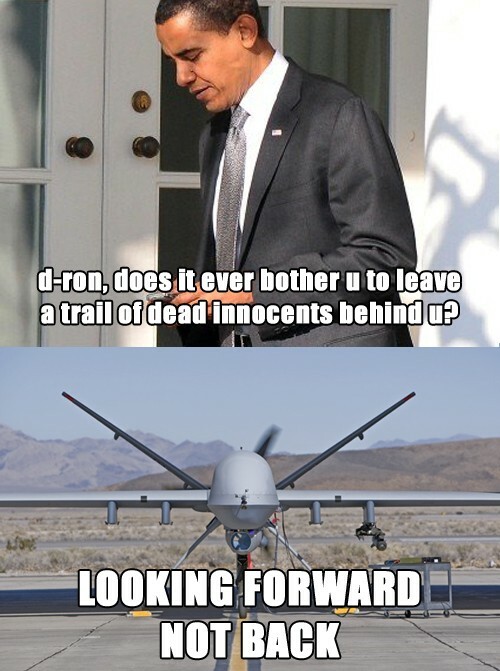 But as the meme develops, other people pose questions to the drone. D-Ron has a clear personality. 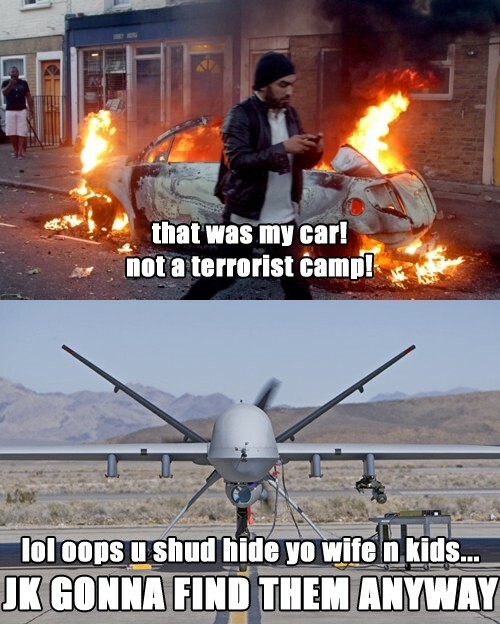 It not only enjoys bombing people, it finds it funny. It doesn’t try to rationalise its slaughter as “just”, on the contrary, it enjoys “collatoral damage”. D-Ron speaks in the language of the internet, and it’s not just the grammar and spelling: its attitude is also like something you’d find on 9gag or Reddit. 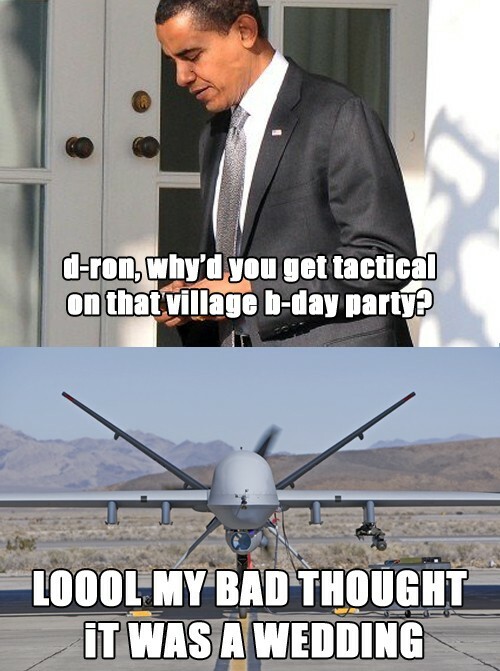 The real power of Texts from Drone is the degree to which D-Ron himsefl is made an actor in the work of Empire, rather than a mute instrument of its policy. He celebrates, without any pretense of military gravitas or regret over mistaken targets, his role as global police. (page 244). We also see drone as “an ally, not an instrument,” Greene writes (244), with goals and language clearly distinct from Obama’s. The third work of drone art we looked at was Muse’s VR music video “Revolt” (from their album Drones) which has been released on the app VRSE and can be viewed using a cheap Google Cardboard headset. A couple of the students had already seen the video (we built Google Cardboards a few weeks ago) so for the rest I hooked my phone up to the projector and showed them the non-stereoscopic version. You can get an idea of the experience by viewing it as a 360? video on YouTube, where you can click and drag to see “behind you”, if you view it in Chrome. It’s a far better experience using Google Cardboard though. This video is entirely focalised from the point of view of a drone. 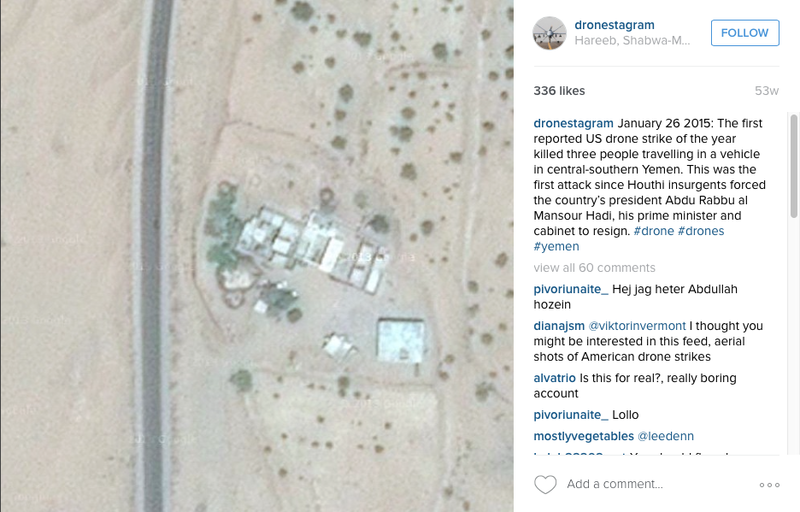 The video begins with startup code, and ends when the drone is shot down. You see everything through the wide-angle lens of a surveillance drone, and at some points in the video, information about enemies or targets (the women charging the police officers) and assets (the police officers) is overlaid the image. At one point (about 4 minutes into the video, one of the musicians even kicks the drone, apparently breaking it. We had a great discussion about how the viewer is really positioned here. The lyrics tell us “You’re not a drone!” (encouraging us to revolt) and yet we are clearly locked into the drone’s perspective. The heroes of the video and the album are clearly the women who revolt, but we see the events from the perspective of a drone who is pitted against them. The students pointed out that we seemed to switch drones at certain points (for instance after being kicked) and so rather than showing an anthropomorphic drone, perhaps the video is simply focalised from the perspective of a drone pilot working at some remote console. Much to discuss here. Here is the reading list for the class.